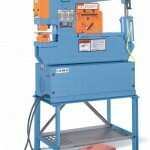 Ironworkers punch, shear, and form using high pressure and special tooling. This particular ironworker is a Scotchman Porta-Fab 45-ton ironworker–and is capable of exerting up to 45 tons of pressure on a die (e.g., for punching holes). Nearly every operation the ironworker can perform can be done by other machines in the metal shop–holes can be drilled (instead of punched), bar stock can be sawed (instead of sheared), and so on. However, the ironworker can perform operations much faster, though the resulting holes or cuts may not be as clean or accurate as other methods. It is thus well suited to rapid fabrication where tolerances are measured in 32nds of an inch, for example, rather than thousandths. It is particularly useful in combination with the MIG welder, for example. This ironworker is hydraulic, and can be reversed at any time. (Other types of ironworkers employ heavy flywheels that, once activated, perform a complete cycle that cannot be interrupted.) The slow and controllable movement, however, is backed by 10 to 45 tons of force, which can easily break misaligned tooling. Careful use is required for safe operation.